The wonders of creation – so beautiful. An amazing way to start your day. Thank you, Vivian. OH love those sun rises!!! I bet it was BEAUTIFUL to feel! Absolutely wonderful! Dear Vivian, thank you very much for sharing this beautiful pictures! It’s so serene. Makes me want to be there. Lovely photos. “desert sunrise” wow, what a gorgeous sky, incredible! Your picture is so beautiful! It brought joy to my heart when I looked at it! Thank you so much! Yes, I will put your name on the image itself, and will put a link to your blog from my page that discusses the project. I’ll be done with it all by this Sunday; I’ll send you the links as soon as it’s done. Can you get my email from my registration to comment? Oops…nevermind. I just saw your email 🙂 Thank you again. Viv–I’m visiting this page during Easter Week, and so many of your images speak of the fiery symbolism these days mean to me and to many others. Love that you’ve included the II Peter verse. Befitting. Thank you for all this work!–M. You have some beautiful photos on your site. Thanks for stopping by my blog too! I’m delighted that you enjoy the photos! And your blog is positively inspirational! The colors are so intense in the desert-these are beautiful images! Thank you for writing me such a nice note, I’m delighted that you enjoyed these. 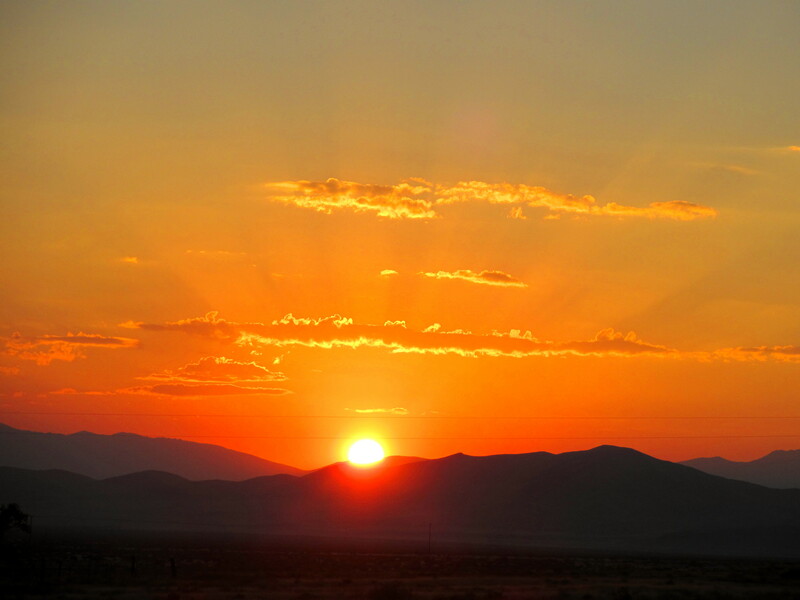 I was truly blessed to witness each of these desert sunrises! A google image search brought me here, and I’m beginning to believe it can’t be coincidence. I’m about to release my first EP, it’s a Christian rock project, and my band is called “Skydive Sunrise.” If it’s alright with you I would love to modify one of these images and use it for my album art and website. I’m afraid I couldn’t pay you anything, as much as I’d love to, they’re beautiful shots, but if there’s any way I could use one of these it would really be great. I hope to hear from you soon, and once again, great photos! Thank you for writing me such a nice note, your project sounds wonderful and I would definitely consider granting you the use of one of these sunrise images. Let me email you so we can work out the details! Hi 🙂 What beautiful photography! I found your blog while searching for images, and I am so impressed!!! I am an artist and I’m attempting to do a painting of a Mexican riding a donkey out of the sunset. Would there be any chance of using your gorgeous sunset photo as reference for my sunset? I am more than happy to credit you for it! Cheers! Absolutely on all counts Vivian! Thank you so much!! I very much appreciate it 🙂 I will email you soon (hopefully) with a photo of the finished painting. The lighting is spectacular. Good job.